Lately I've been interested in Turkish cooking and have used a wonderful cookbook, Classic Turkish Cooking (St. Martin's Press). We didn't purchase it in Turkey, but rather got it upon our return from Istanbul. We were so intrigued with the cooking there that we wanted to try it at home. Especially good are the eggplant dishes, the puddings, and the lamb dishes. There are some spices and herbs that are uncommon, but you can work around those difficulties. The photographs alone are worth the purchase. This is a delightful accompaniment to the meatballs, below. Cook the onion in the butter until translucent, and then stir in the rice. Sauté for a minute or so. Pour in the hot stock, and add the salt and pepper to your taste. Bring the liquid to a boil, reduce the heat and cover and allow to simmer for fourteen minutes, or until all of the liquid has been absorbed. 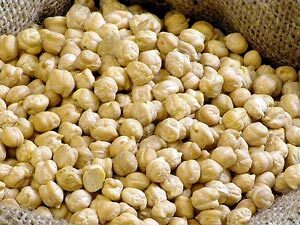 Add the garbanzo beans and cover, so that the beans are warmed by the other ingredients. Allow to sit for ten to fifteen minutes. When ready to serve, fluff the rice with a fork. 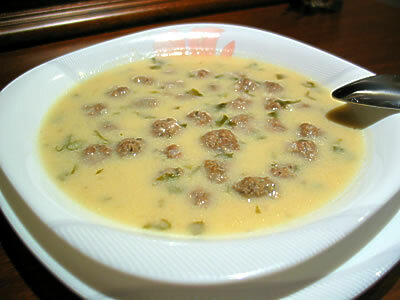 Using "Avgolemono" to describe a Turkish dish is probably politically very incorrect. The funny thing is that their cuisines (well most Middle-Eastern cuisines) are related. At any rate, I think that you will find this a rather delicious dish. 2 medium potatoes, peeled and diced. Place all the meatball ingredients into a large bowl that you can comfortably get your hands into, and knead the ingredients together until they form something of a paste. Take about 1 Tablespoon of the material and roll into a ball, then dusting it with flour. Place on a plate on the side. In a pan filled with the water, add the carrots, and bring to a boil. Cook the carrots for 5 - 7 minutes, and then drop the meatballs into the liquid. Cover the pot, so that the water returns to a boil. At that point reduce the heat to a simmer and set the timer for 20 minutes. Add the potatoes and any additional water, if necessary and cook for an additional 20 minutes. During the final five minutes of cooking, whisk the egg yolks until lemon-colored, and then whisk in the lemon juice until it emulsifies. Temper the egg mixture by whisking in a bit of the hot meatball liquid, and then return all of it to the pot. Carefully stir the sauce (do not boil, or the sauce will curdle), and then season to taste and serve. 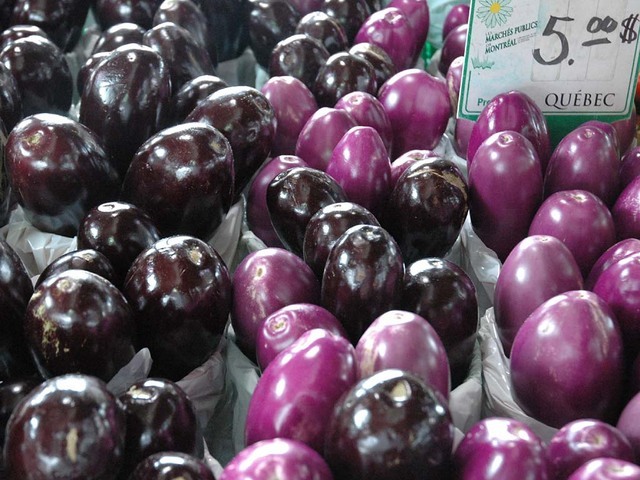 At the Ferry Plaza Market the other day I found small Eggplants, about the size of a large egg. They were perfect for this recipe. 12-14 small eggplants, or a larger eggplant cut in chunks, enough to equal 3 cups. Sauté the onion until translucent and then add the garlic until it begins to color. Add the coriander seed and toss for a couple of seconds. Next, add the eggplants and toss until they are coated with the oil from the pan, and cook for two minutes. Add the sugar, tomatoes, and a half cup of the chopped hers. Cover the pan and gently simmer for fifteen minutes. 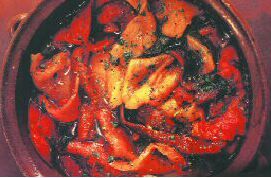 Add the remaining herbs and salt and pepper to taste, and continue to cook for another fifteen minutes, uncovered, so that the liquid is reduced. This dish may be served at room, but is best hot.